, an English divine of remarkable learning and steadiness in suffering for the principles of tha | Revolution in 1688, was born in 1649, in Warwickshire and being put to St. Paul’s school in London, studied with such* success and reputation, that as soon as he was fit for the university, he was made keeper of the library to that school. In this station he applied himself to the Oriental languages, in which he made great progress. He was of Trinity-college, Cambridge, but left the university without taking a degree. He entered into orders, and was presented by a friend, Mr. Robert Biddulph, in 1669-70, to the rectory of Corringham in Essex. This living, worth only 80l. 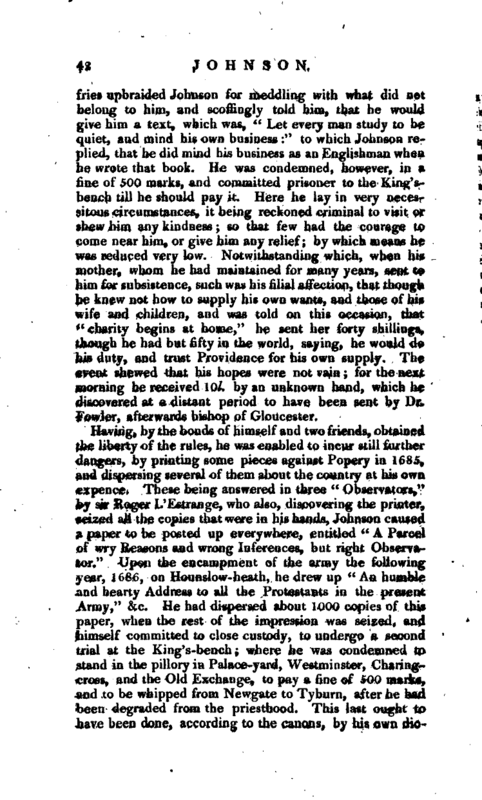 a year, was the only church preferment he ever had and, as the air of the place did not agree with him, he placed a curate upon the spot, and settled himself a^ London; a situation so much the more agreeable to him, as he had a strong disposition for politics, and had even made some progress in that study before he was presented to this living. Of this truth we cannot have a stronger evidence than from himself. In a piece printed 1689, speaking of bishop Burnet’s Pastoral Letter, published a little before, in order to place king William’s right to the crown upon conquest, he expresses himself thus: “I will presently join issue with this conquering bishop, for I have not been afraid of a conqueror these 18 years; for long since I used to walk by the New Exchange gate, where stood an overgrown porter with his gown and staff, giving him a resemblance of authority, whose business it was to regulate the coachmen before the entrance; and would make nothing of lifting a coachman off his box, and beating him, and throwing him into his box again. I have several times looked up at this tall mastering fellow, and put the case: Suppose this conqueror should take me up under his arm, like a gizzard, and run away with me; am I his subject? No, thought I, I am my own, and not his: and, having thus invaded me, if I could not otherwise rescue myself from him, I would smite him under the fifth rib. The application is easy.” Tract concerning king James’s Abrogation, in our author’s works, p. 207, 268. Dr. Hickes’s production here attacked, was a sermon preached before the lord mayor in 1681, and published in 1682.
in a book entitled “Julian‘ the Apostate, &c.” published in 1682. 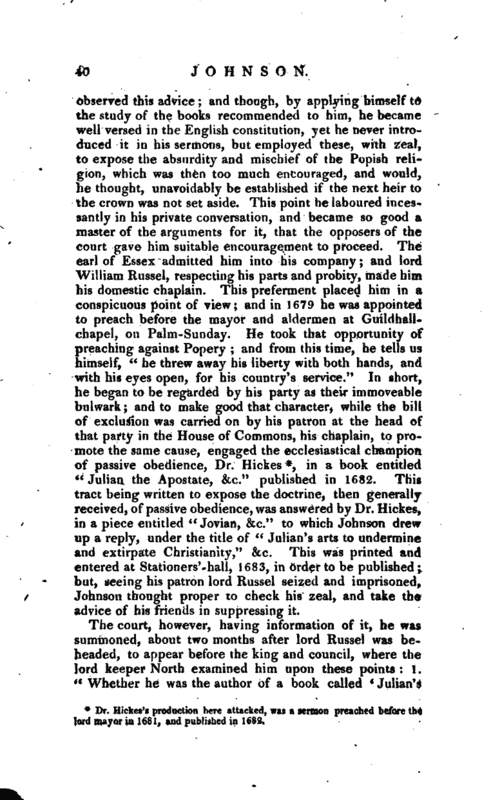 This tract being written to expose the doctrine, then generally received, of passive obedience, was answered by Dr. Hickes, in a piece entitled “Jovian, &c.” to which Johnson drew up a reply, under the title of “Julian’s arts to undermine and extirpate Christianity,” &c. This was printed and entered at Stationers’-hall, 1683, in order to be published; but, seeing his patron lord Russel seized and imprisoned, Johnson thought proper to check his zeal, and take the advice of his friends in suppressing it. The court, however, having information of it, he was summoned, about two months after lord Russel was beheaded, to appear before the king and council, where the lord keeper North examined him upon these points 1. 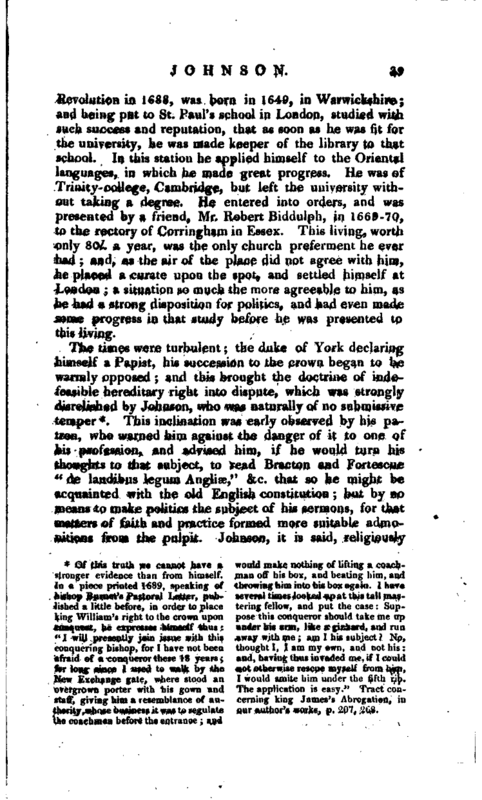 “Whether he was the author of a book called `Julian’s | Arts and Methods to undermine and extirpate Christianity’?” To which having answered in the affirmative, he was aked, “Why, after the book-had been so long entered at Stationers’-hall, it was not published?” To which he replied, “That the nation was in too great a ferment to have the matter further debated at that time.” Upon this he was commanded to produce one of those books to the council, being told that it should be published if they approved it; but he answered, “he had suppressed them himself, so that they were now his own private thoughts, for which he was not accountable to any power upon earth.” The council then dismissed him; but he was sent for twice afterwards, and the same questions urged, to which he returned the same answers, and was then sent prisoner to the Gatehouse, by a warrant of commitment dated Aug. 3, 1683, and signed by sir Leoline Jenkins, one of the privy council, and principal secretary of state. 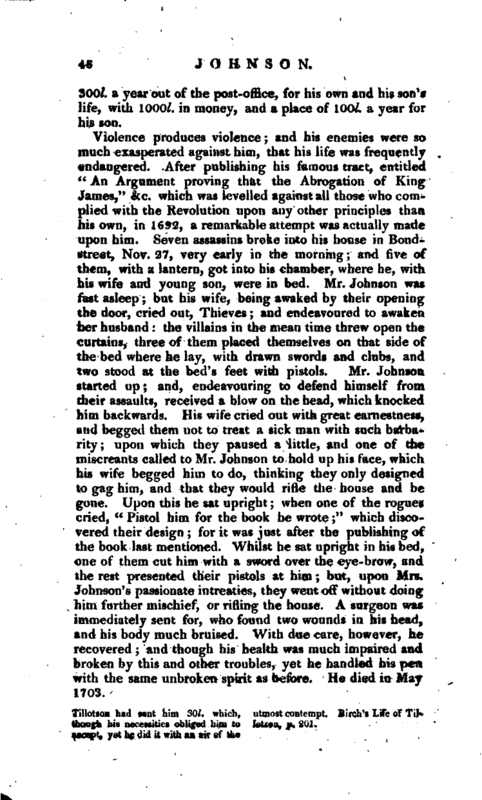 He was bailed out of prison by two friends, and the court used all possible means to discover the book; but, being disappointed in the search, recourse was had to promises, and a considerable sum, besides the favour of the court, was offered for one of the copies, to the person in whose hands they were supposed to be lodged. 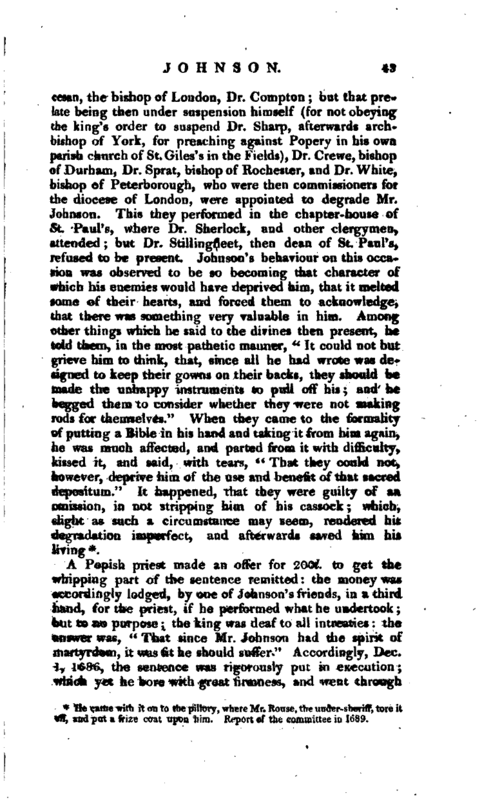 This was refused; and, as neither threats nor promises prevailed, the court was obliged to drop the prosecution upon that book, and an information against Johnson was lodged in the King’s-bench, for writing “Julian the Apostate,” &c. The prosecution was begun and carried on by the interest of the duke of York. 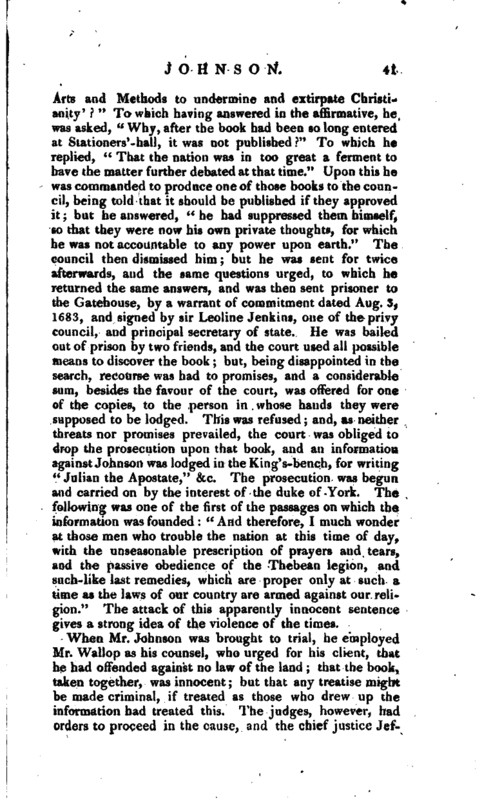 The following was one of the first of the passages on which the information was founded: “And therefore, I much wonder at those men who trouble the nation at this time of day, with the unseasonable prescription of prayers and tears, and the passive obedience of the Thebean legion, and such-like last remedies, which are proper only at such a time as the laws of our country are armed against our religion.” The attack of this apparently innocent sentence gives a strong idea of the violence of the times. 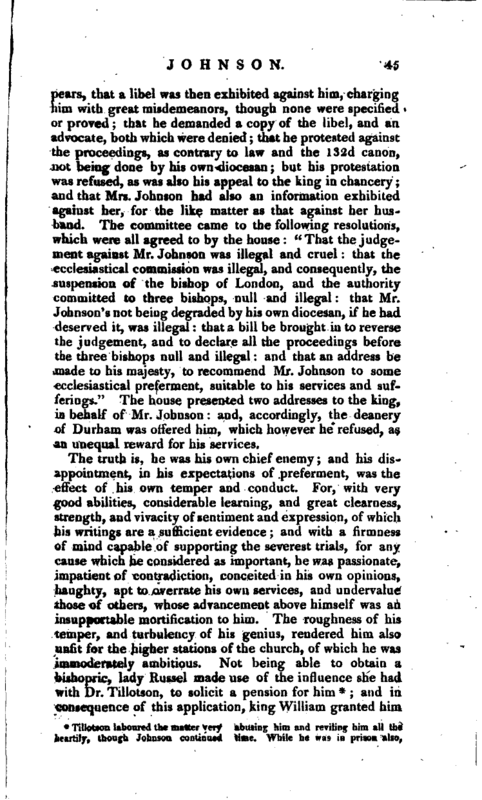 When Mr. Johnson was brought to trial, he employed Mr. Wallop as his counsel, who urged for his client, that he had offended against no law of the land that the book, taken together, was innocent but that any treatise might be made criminal, if treated as those who drew up the information had treated this. 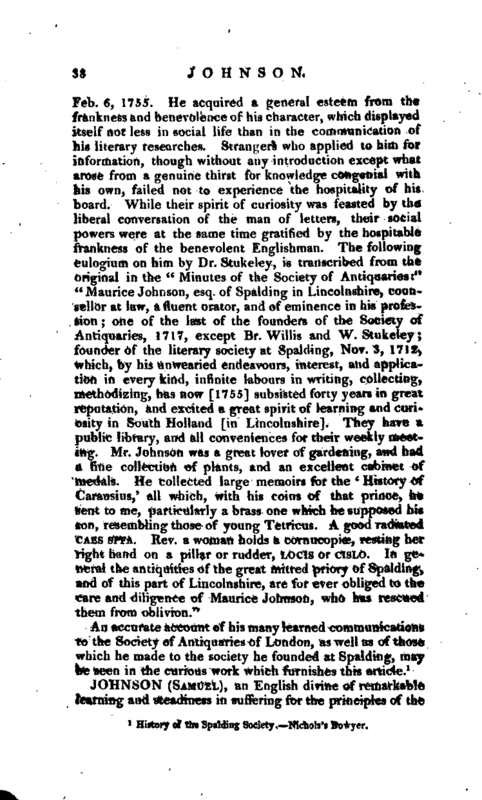 The judges, however, had orders to proceed in the cause, and the chief justice | Jeffries upbraided Johnson for meddling wi^tt what did not belong to him, and scoffingly told him, that he would give him a text, which was, “Let every man study to be quiet, and rnmd his own business:” to which Johnson replied, that he did mind his business as an Englishman when he wrote that book. He was condemned, however, in a fine of 500 marks, and committed prisoner to the King’sbench till he should pay it. Here he lay in very necessitous circumstances, it being reckoned criminal to visit or shew him any kindness; so that few had the courage to come near him, or give him any relief; by which means he was reduced very low. Notwithstanding which, when his mother, whom he had maintained for many years, sent to him for subsistence, such was his filial affection, that though he knew not how to supply his own wants, and those of his wife and children, and was told on this occasion, that “charity begins at home,” he sent her forty shillings, though he had but fifty in the world, saying, he would do his duty, and trust Providence for his own supply. The event shewed that his hopes were not vain; for the next morning he received lOl. by an unknown hand, which he discovered at a distant period to have been sent by Dr. Fowler, afterwards bishop of Gloucester. He came with it on to the pillory where Mr. House, the under-sherrif, tore it off, and put a frize coat upon him, Report of the committee in 1689. Excepting this, he seems to have been cast in much such a mould as Jobn Lilburn, to whom he bore a great re­ semblance, both in the hardiness of his temper, and in the quarrelsomeness of it. Tillotson had sent him 30/, which, though his necessities obliged him to accept, yet he did it with an air of the utmost contempt. 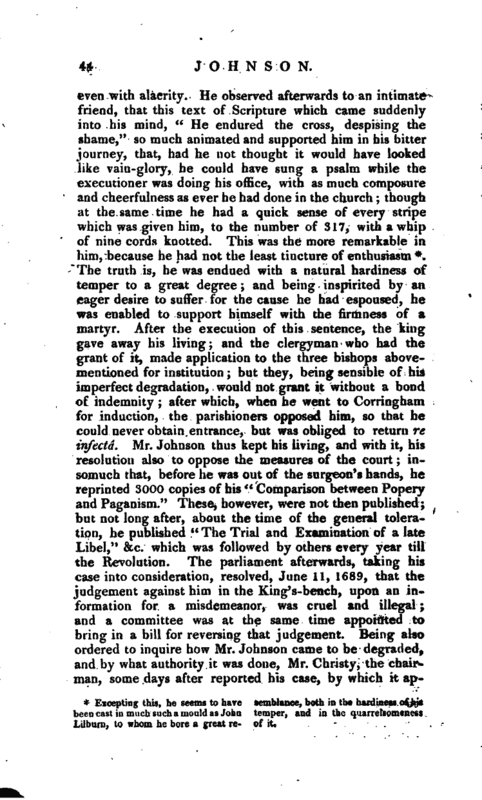 Birch’s Life of Tillotson, p. 201.
and in consequence of this application, king William granted him, | 300l. a year out of the post-office, for his own and his son’s life, with 1000l. in money, and a place of 100l. a year for his son. Biog. Brit. Gen. Dict. Life prefixed to his Works. 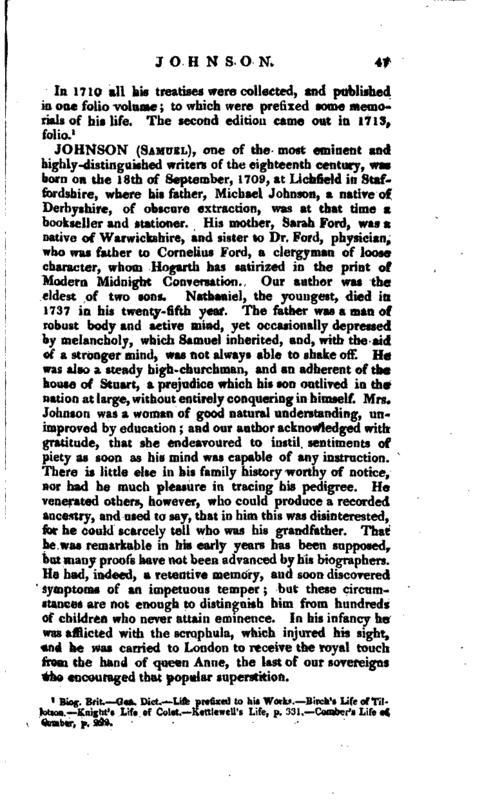 Birch’s Life of Tillotson. Knight’s Life of Golet, Kettlewell’s Life, p. 331, Comber’s Life of Comber, p. 222.